"All the breadcrumbs you want, at a great price. Add your own seasoning so you know what you are getting!" Using tongs, place bread slices directly on oven racks. Leave in oven until hard and golden brown, about 30 minutes; darker if you prefer. Remove and cool on wire rack. 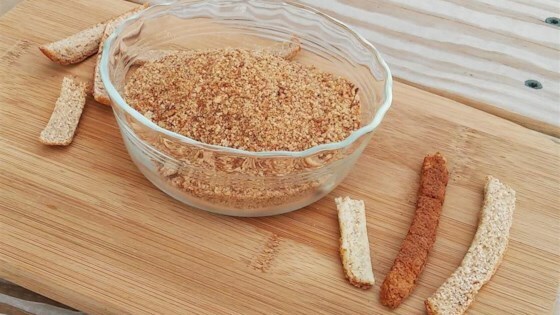 Crumble slices into a large bowl until reduced to fine crumbs, or place in bowl of food processor and process until fine. Crispy tortilla bowls made simple by Chef John! I put the toast in a big plastic freezer bag and rolled the rolling pin over it to crush the bread into crumbs. Easy and quick, love it!